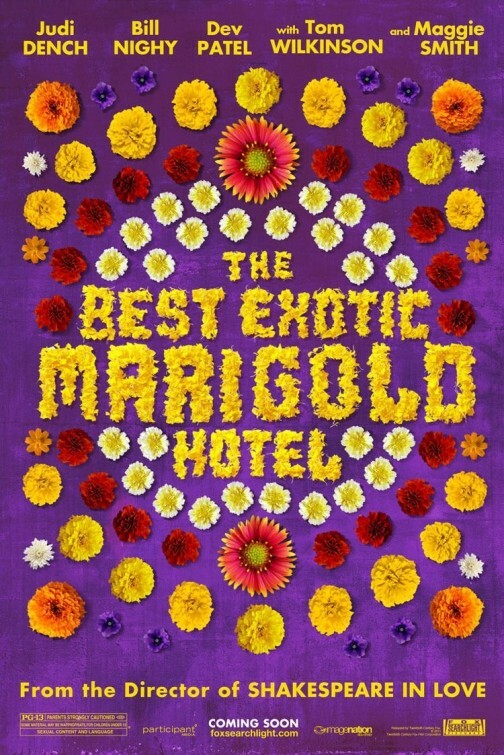 A group of elderly British men and women travel to India together to stay in the Marigold Hotel. Evelyn (Judi Dench) is a widow who has never had a job of her own and is looking for employment overseas to pay off her husband's debts. Graham (Tom Wilkinson) is a judge who has retired and is looking for someone he once knew in India. Douglas (Bill Nighy) and his stubborn wife Jean (Penelope Wilton) have moved overseas because they are dissatisfied with the residency they've been put into after losing their money. Madge (Celia Imrie) and Norman (Ronald Pickup) are both looking for love but he strongly prefers the younger options. Muriel (Maggie Smith) is a former housekeeper and racist in need of a hip operation. The hotel they are staying in is falling apart, buoyed only by the enthusiasm of its owner Sonny (Dev Patel), who is trying to court a girl working in a call centre, much to the disapproval of his mother. The Best Exotic Marigold Hotel postures as a 'fish out of water' movie but surprises us with its sensitivity and appreciation for characters instead of broad personalities. Initially it seems as though these will be caricatures and familiar archetypes but growth is provided in sensible, mature scenes that ensures that the film does not have to resort to no-brainer slapstick or obvious humour to be engaging. The film cleverly aligns us with the expectations of the characters and then subverts them for both parties. Various relationships are not sown back together in the end and some seemingly predictable romances do not blossom like we've been conditioned to think that they will. Instead, the main characters are all collectively linked by their age and a feeling of redundancy in life. There are intelligent scenes, like the one where Evelyn gives a demonstration in a call centre to show her social experiences, which restore each of the characters feelings of self-worth. We're told intelligently and optimistically that: "Everything will be alright in the end and if it's not, it's not the end". What's equally pleasing about the screenplay is the way that it reveals character backstories, through the dialogue, so that we can sympathise with almost everyone in the film and in fresh ways too. Perhaps the richest of these is Tom Wilkinson's Graham, who grew up in India as a child and has a secret that is actually quite affecting. When he returns to an area that he thought he knew he discovers that many of the houses have now been removed. It's a metaphor for his disconnection but also the limitations of his lifespan too. Arguably, if this was a Hollywood film I don't think we would have these kinds of poignant details. Aside from its humanity, the film is also strikingly funny thanks to the deft British wit that is frequently hilariously and ironic. When Douglas' prudish wife says that she doesn't know how they're going to celebrate their 40th anniversary, another character chimes in to say: "Perhaps a moments silence?" The entire cast, some of which are given some fairly unglamorous roles, are smart and charismatic. Even Dev Petal, who at first seems like a token Indian stereotype, develops his role into someone battling feelings and desires against personal conflict. India itself is another great character in the story. As you would expect, filming on location means that we fully obtain the country's vibrancy, colour and people, with crowds of bodies constantly in motion on screen. Although on the outskirts the film might seem like a light, breezy comedy, I think people are going to surprised by how much attention has been given to the humanity as much as the jokes. The writing is that impressive.